Stop by the AANA Insurance Services booth at the Assembly of Didactic and Clinical Educators (ADCE) in Houston, February 13-16, to learn about malpractice resources to fit into your curricula or to request a webinar or in-person presentation. To learn more, visit our online Program Director Malpractice Insurance Toolkit. Positions are available on AANA committees for CRNAs and student registered nurse anesthetists. Check out the committee page on the AANA website to read about the various opportunities. Deadline for committee request submissions is April 1, 2019. Please note: If you currently serve on a fiscal year 2019 committee, you must reapply for fiscal year 2020. Consider Nominating a Colleague for an AANA Award! Do you work with an outstanding program director, didactic instructor, or clinical instructor? Do you know someone who has spent a lifetime advancing the practice of nurse anesthesia as a practitioner, educator, clinician, or advocate? Consider nominating your colleague for one of the national AANA recognition awards. Visit Recognition Awards for details on the Agatha Hodgins Award for Outstanding Accomplishment, Helen Lamb Outstanding Educator Award, Alice Magaw Outstanding Clinical Practitioner Award, Ira P. Gunn Award for Outstanding Professional Advocacy, Clinical Instructor of the Year Award, Didactic Instructor of the Year Award, and Program director of the Year Award. Nomination deadline is March 15th. CMS updated information on preliminary eligibility for 2019 Merit-based incentive payment system (MIPS) reporting on the Quality Payment Program (QPP) Participation Status website. CRNAs can log in with their National Provider Identifier (NPI) to find out if they are eligible to participate in MIPS, based on the first determination period from October 1, 2017 through September 30, 2018. If a CRNA is not eligible at this time, the status could change and he or she could be eligible to report, based on the second determination period (October 1, 2018 through September 30, 2019). As a reminder, eligibility is determined by data from the Provider Enrollment, Chain and Ownership System (PECOS) and Medicare Part B claims. On Tuesday, Jan. 14, AANA President Garry Brydges, DNP, MBA, CRNA, ACNP-BC, FAAN, sent an email to members asking for your help with our grassroots efforts. The AANA supports the draft report’s recommendation to expand the availability of non-physician pain specialists. However, we are gravely concerned that another recommendation in the report for credentialing and training requirements limits the pathways available for non-physician practitioners, such as CRNAs, to provide interventional pain procedures. The draft report, which is available online, is available for open comment until April 1, 2019. We urge you, your friends, and even patients to submit a comment asking HHS not to adopt these recommendations as drafted and request that the credentialing and training requirements be amended to be inclusive of all types of practitioners and their educational pathways. Login to https://crna-pac.com/composeletters/2883 with your AANA username and password. You will be directed to a sample letter that you can personalize and send. Click “send letter” to have your letter posted to the comment site. Please note that all comments are public. Non-AANA members can submit comments here through regulations.gov website. If you have any questions, please don’t hesitate to contact AANA Federal Government Affairs at info@aanadc.com or 202-484-8400. War Stories: If you are a CRNA who has served during any of the United States' military operations and maneuvers of the 20th or 21st centuries (World War I, World War II, Korean War, Vietnam, The Invasion of Grenada, Gulf War, Iraq War, Afghanistan, Syria, etc. ), the AANA is interested in your experiences as a matter of historical preservation and record. Share your experiences with your colleagues. See what others have written. If you are interested in submitting your war story, see War Stories' Submission Guidelines (see right side of linked page). Deployed CRNAs: The American Association of Nurse Anesthetists is proud to recognize and pay tribute to the Certified Registered Nurse Anesthetists (CRNAs) who are stationed around the world and at home, administering safe, quality anesthesia care to the United States' Armed Forces' servicemen and women. See what others have written. If you want to share your information, see Deployed CRNAs Submission Guidelines. Kirsten Pierce, MSN, CRNA, has always been interested in nature and outdoor learning. After speaking with locals about kid-friendly options, she decided to pursue her dream of opening a nature-inspired museum for kids in southwestern Wake County, N.C. She is currently fundraising to make the dream a reality. "Carolina Children's Museum's vision involves creating an engaging and safe environment where children can interact with others and learn directly through play and hands-on experiences," says Pierce in an interview with WRAL's GoAskMom. Learn more. Daniel Nash, DNAP, CRNA, is the first recipient of the Acute Surgical Pain Management (ASPM) Fellowship “Outstanding Achievement Award,” presented at Middle Tennessee School of Anesthesia’s most recent commencement ceremony. Nash was a member of the ASPM Fellowship’s first cohort and completed the certificate program in 2018, along with 12 other CRNAs. Learn more. As a CRNA, you make critical decisions all the time, oftentimes without even thinking about it. Your years in school prepared you to make sound medical decisions at a moment’s notice. But beyond the operating room, some important choices may not come as naturally. With today’s high demand for CRNAs, many practitioners are wondering if freelancing might be right for them, either full-time, part-time, or as a supplement to their W-2 job. We’ve put together this overview of some of the major financial implications of freelancing versus working W-2. Of course, only you can decide if the freelancing lifestyle is right for you, but the potential to control your own schedule, earn a higher income and make larger contributions to your retirement accounts might influence your decision. What’s important is choosing the path that helps you reach your personal goals. Learn more. Drastic changes are not always needed to see an improvement in your budget. Learn more. The Division of Anesthesia for Nurses (AFN) invites applicants for a faculty member position. We are seeking a motivated Certified Registered Nurse Anesthetist (CRNA) who has demonstrated skills in nurse anesthesia education and clinical practice. Learn more. As a CRNA at Mayo Clinic, you will be a part of a world-renowned surgical and procedural environment that presents opportunities that may rarely be experienced elsewhere. As our surgical and procedural practices grow, we invite you to join our diverse team as we provide health, hope, and healing to people from all walks of life. Learn more. The Certified Registered Nurse Anesthetist (CRNA) is a licensed registered nurse with advanced specialized training in the administration of anesthesia. The CRNA administers, monitors, and adjusts anesthetic doses to individual patients, from neonatal through geriatrics, during surgery and other procedures as follows. Learn more. As the fourth-largest academic medical center in the United States, Level-1 Trauma Center, and Comprehensive Transplant Center, UAB sees it all. From same-day surgery to complex transplants and heart procedures, CRNAs have the chance to experience a variety of cases in over 80 anesthesia locations and work alongside nationally-ranked surgeons. Learn more. Career Resources: The turn of the year is the perfect time to catch up on industry news or read tips about advancing your career. The AANA Career Center is a great resource, whether you're looking for industry updates or available positions. Location Radius Job Search: Searching for a job can be time-consuming. Now when entering a job search location, you will be presented with matching locations to autocomplete your search. You can also choose a specified mile radius from which to pull open jobs. Job Alert Quick Create: When searching for a job on CRNA Careers, you can also create a job alert. In one easy step, you can search for a job and be alerted when a job you're interested in becomes available. Wishing you career success and a happy 2019! Get started today! The ENGAGES study explored the potential of electroencephalography (EEG)-guided anesthetic administration in older adults having major surgery. Because intraoperative electroencephalogram waveform suppression is implicated in excessive general anesthesia and postoperative delirium, researchers wondered if EEG-guided anesthesia administration would prevent this complication. Among 604 participants aged 60 years and older who were randomly assigned to the technique, postoperative delirium was observed in 26 percent of them within the first five days postoperatively. By comparison, 23 percent of the 609 enrollees who received typical anesthetic care also presented with the complication during that same time frame. The difference was not considered to be statistically significant, and the investigators agreed that the evidence did not support EEG-guided anesthetic administration as prophylaxis for postoperative delirium in older surgical patients. From "Effect of EEG-Guided Anesthetic Administration on Postoperative Delirium Among Older Adults Undergoing Major Surgery"
Journal of the American Medical Association (02/05/19) Vol. 321, No. 5, P. 473 Wildes, Troy S.; Mickle, Angela M.; Abdallah, Arbi Ben; et al. Evidence shows that adjuvant dexmedetomidine and ketamine perform similarly in multimodal analgesia regimens for minimally invasive thoracic surgery. Led by Memorial Sloan Kettering Cancer Center thoracic anesthesiologist Alessia Pedoto, MD, researchers performed a retrospective analysis of patient records for 141 people who underwent minimally invasive lung lobectomy. Sixty-seven had received intravenous, intraoperative ketamine, and 74 had received an intraoperative infusion of dexmedetomidine. Postoperatively, pain was managed with IV opioid patient-controlled analgesia, acetaminophen, dexamethasone, and nonsteroidal anti-inflammatory drugs (NSAIDs). Comparing between-group intraoperative and postoperative morphine equivalents, NSAIDs, sedation, and pain scores upon arrival in the post-anesthesia care unit (PACU) and four hours after surgery, the investigators found that ketamine was associated with more sedation and higher pain scores in the PACU, but that the differences compared with dexmedetomidine were not clinically significant. Otherwise, the two agents behaved much the same. 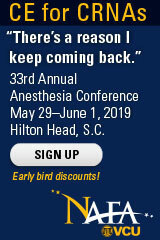 "When used as part of multimodal analgesia, dexmedetomidine and ketamine appear to have similar effects on intraoperative analgesia and hemodynamic parameters in patients undergoing minimally invasive thoracic surgery," said Pedoto, who reported the results at the 2018 annual meeting of the European Society of Anaesthesiology. "We observed no difference in surgical times, intraoperative fluids, estimated blood loss, pressor requirement, or length of stay in either the PACU or hospital." Prospective trials are needed to validate the findings, she noted. From "Dexmedetomidine, Ketamine Show Similar Analgesia for Minimally Invasive Thoracic Surgery"
Doctors and hospitals are starting to offer laboring women the option of virtual reality (VR), which may ameliorate their pain and anxiety. Although the technique is unlikely to replace intravenous interventions and epidurals, using goggles and headsets to mentally transport patients to a place of peace and calm could be useful in the interim before pain becomes unbearable. It might be one way, for example, to avoid early epidural, according to Melissa Wong of Cedars-Sinai in Los Angeles, who is spearheading a study of VR in labor. The work is one of only a few small studies in this area, but VR has been widely demonstrated as effective pain relief in other settings—including painful pediatric procedures. Experts suspect that the immersive nature of VR gets the brain to focus on related activities, instead of on painful sensations. For labor specifically, the VR experience is set up to incorporate breathing exercises, positive affirmations, mindfulness, and other elements that are known to help refocus attention away from pain during the labor process. Research on labor and VR includes a recent study by the Phoenix-based nonprofit Banner Health that found that VR reduced the use of IV pain medication and another, ongoing investigation that is examining the use of VR during epidural placement. From "Virtual Reality May Reduce the Pain of Childbirth"
With suicide rates continuing to climb in the United States, new hope for a "cure" is growing around the idea of ketamine therapy. Introduced decades ago, the powerful anesthetic is now seen as a way to treat depression that resists conventional therapy. The seed was planted in the mid-1990s, with interest low at first but gradually picking up. A National Institutes of Health study in 2006 found that a single dose of ketamine provided "robust and rapid antidepressant effects" within just two hours, while at least one later investigation documented rapid alleviation of suicidal thoughts in as little as 40 minutes. As the evidence mounted, ketamine clinics started surfacing around 2012 in large metropolitan areas, where customers pay about $500 for an infusion—a potential solution for those with the financial means and access to the centers. For those without one, the other, or both, there is still hope. The first FDA approval of a ketamine-based drug could come as early as this spring; and a formulation to treat suicidal thinking could be sanctioned within two years. Meanwhile, work continues to develop a better version of the drug—whose precise treatment pathway, safety, and long-term effects remain uncertain. From "Ketamine Could Be the Key to Reversing America's Rising Suicide Rate"
Taking hydrocodone at the same time as a selective serotonin reuptake inhibitor (SSRI) like Prozac or Zoloft could elevate patients' pain and maybe even make them more vulnerable to opioid abuse, researchers warn. Both hydrocodone and SSRIs are widely prescribed—the former typically for postoperative pain and the latter for psychiatric disorders—but the way they work clashes. Hydrocodone needs a liver enzyme to convert it into a form that alleviates pain, but SSRIs suppress that very enzyme. With that in mind, the team from Stanford analyzed the electronic health records of 4,306 patients with depression who underwent surgery at Stanford Health Care. They discovered that patients on an SSRI regimen who received hydrocodone—or another opioid that requires conversion by the liver—suffered from higher levels of postoperative pain. In turn, "patients who experience greater pain are likely to take more opioids and to take them for longer periods, both risk factors for opioid abuse," notes Ian Carroll, MD, a senior author of the study. Prescribing non-opioid pain medication or opioids such as morphine, fentanyl, and oxycodone that do not require conversion could help avoid opioid abuse, according to the team. Their study appears in PLOS ONE. From "For Patients on Antidepressants, a Common Opioid Is Less Effective"
Use of Diazepam and Alprazolam for Pain Rising in U.S.
Benzodiazepines increasingly are being used prescribed off-label to treat pain, based on an analysis of data on 386,457 outpatients visits from 2003 to 2015. Researchers determined that the share of those visits tied to a benzodiazepine prescription nearly doubled from 3.8 percent to 7.4 percent. With use for classic indications such as anxiety, depression, insomnia, and seizures holding relatively steady, much of the gain in prescribing activity came from primary care physicians who treated patients for back or other chronic pain. Those prescriptions accounted for 8.5 percent of benzodiazepine use by 2015, up from 3.6 percent in 2003. Using benziodiazepines as an alternative to opioids is a bad idea, according to study co-author Sumit Agarwal, MD, of Brigham and Women's Hospital in Boston. He cited potential adverse effects—including addictive properties and breathing issues—that can occur much in the same way as they do with opioids. "They are involved in falls and fractures, motor vehicle accidents, overdoses, and deaths," Agarwal added. "These risks are even more pronounced when they are combined with other drugs that alter the central nervous system." The study found that the proportion of patients taking benzodiazepines concomitantly with opioids quadrupled from 0.5 percent to 2 percent during the study period, and the number taking them at the same time as other sedating medications doubled from 0.7 percent to 1.5 percent. The study is reported in JAMA Network Open. From "Use of Diazepam and Alprazolam for Pain Rising in U.S."